I shouldn’t have said duh, I guess. My husband and I were discussing the upcoming verdict this afternoon and I said that it would not surprise me that this would be a ‘false positive’ verdict. Do you think for one minute that Planned Parenthood, NARAL, NAF, Obama and every other abortion rights flunky and has-been already have a plan in place for a guilty verdict? Of course they do. I do believe that Goliath has just been stirred. Understand – this was never about ‘choice’. What Gosnell did and what EVERY abortionist does is BASED ON GREED. Abortion is essentially unregulated, Obama blesses it, liberals LOVE it, and doctors that can’t make the cut NEED it for an income…what else do you expect? This is by no means over. This is just the tip of the abortion iceberg. Abortion hacks are EVERYWHERE preying on the fear of pregnant women and girls TO MAKE MONEY. Are the babies vindicated? Not really. No, I’m not trying to pop the WOOHOO bubble of my prolife peers, what I am saying is that today there are 4000 others that died with no trial, no judge, no jury…only abortion death. 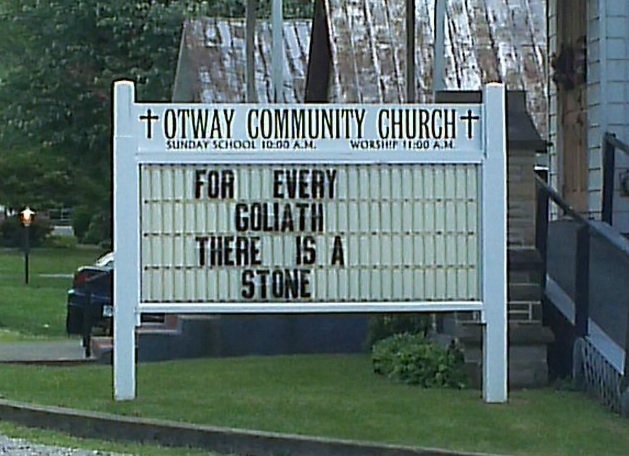 For EVERY Goliath there is a stone…and that stone’s name is JESUS CHRIST. Previous postSIDEWALK CHRONICLES: Death is Sold Here. Next postDEATH IS SOLD HERE: GOSNELL CHOSE LIFE. Truth is told here on Kathrine’s blog!